The native Ojibwe people know Isle Royale as Minong, meaning “the good place,” an understatement of the highest order. This, our 43rd national park, is one we’d been dreaming of visiting for a long time. Isle Royale National Park is made up of the largest island in Lake Superior and more than 400 surrounding smaller islands located 20 miles off the arrowhead of Minnesota and 45 miles from Michigan’s Upper Peninsula. Thunder Bay, Ontario and Duluth, Minnesota are the nearest cities. Nearly all visitors arrive to the park by ferry, leaving from Houghton and Copper Harbor, Michigan or Grand Portage, Minnesota. Crossing time is two hours from Minnesota or between three and six hours from Michigan, but getting to a particular part of the island by boat can take much longer. The Voyageur II ferry we took circumnavigates the island over the course of two days, stopping at Windigo and McCargoe Cove before overnighting at Rock Harbor and completing the circle the next day. Backpacking plans revolve around these transportation timetables, but you can get anywhere with some creative scheduling. Isle Royale’s season is short, open from April 16th through October 31st with ferries running from early May through late September. It’s the only national park that completely closes for the winter season, it’s simply too remote and difficult to get to when it’s frozen. The “busy” time is from mid-July through mid-August, but only about 18,000 people visited it in 2015, so you’ll never encounter a crowd. Once arrived, there are many methods of exploration, a quick day trip (not recommended), a lodge stay with excursions or an an extended wilderness experience. A telling statistic is that the average visitor spends 4 days in Isle Royale, while the average national park visit is just 4 hours. It’s an expansive park, the main island being 45 miles long and 9 miles at its widest, but there are no roads, so the distances are magnified. 99% of the park is designated wilderness, 75% is under water, and other than one lodge and a few cabins, 36 backcountry campgrounds are the only places to stay. All the campgrounds have a pit toilet outhouse, but don’t expect any accommodations beyond a level plot for your tent. This isn’t the national park for everyone, but those who seek it out always end up smitten. 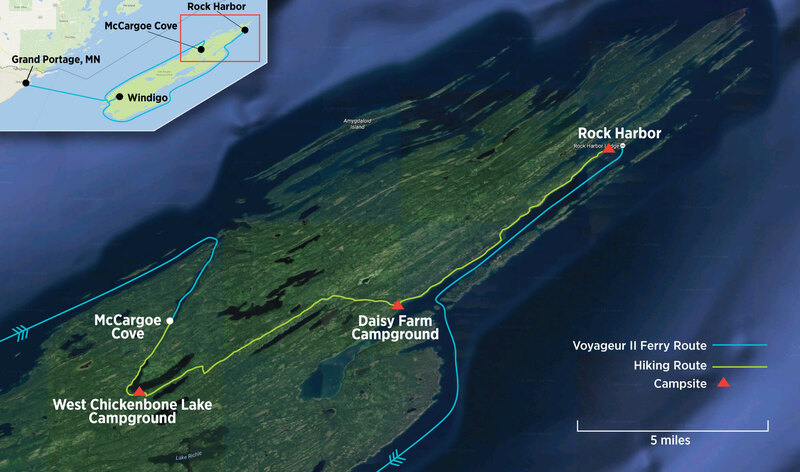 Here’s a map of our Isle Royale itinerary. Blue lines are our arrival and departure ferry routes, green lines mark our backpacking trails and red triangles are our campsites. Since we were traveling from Minnesota, our journey began in Grand Portage. We stayed at the only hotel near the departure dock, the Grand Portage Lodge and Casino of the Lake Superior Chippewa Band. The building seems to be stuck in a perpetual state of construction but the rooms are comfortable and there’s an on-site restaurant and a convenience store across the road. The evening was spent loading and perfecting our backpacks. We’d done some practicing at home, but it’s still a lengthy operation to cram three nights of necessities into a bag in an orderly fashion. We each ended up hauling just under 40 pounds, which might be heavy to more experienced backpackers, but we think was pretty good for our first shot. In retrospect there are only a few things we’d have been able to leave out. At the crack of dawn we made the short drive to the Voyageur II dock on the other side of Grand Portage Bay. All voyages to the park require advanced reservations. People were beginning to assemble when we arrived an hour before the 7:30am departure, and soon the captains showed up to check the passenger list and load baggage onto the roof. The two-hour crossing to Windigo was uneventful, with beautiful weather and smooth-ish water by Lake Superior standards. Even on a calm day the boat gets bobbed around by the big lake, so during rough water we heard it can be quite an adventure. The Rock of Ages Light is the first landmark nearing the island, standing guard over a rocky shoal off the southwestern tip. It wasn’t long before we were easing into the shelter of Washington Harbor. At Windigo, everyone had to exit the boat and attend the dockside briefing with Ranger Kaitlyn. This is when it got really exciting. Because we were camping, we also visited the ranger station to fill out a backcountry permit with our planned itinerary and pay our $4 per-night per-person camping fee. We re-boarded the Voyageur to make our way three more hours to our drop off point at McCargoe Cove. The route follows the northern shore past mile after mile of undisturbed forest. There’s no sign of human impact visible from the boat. Off the left side, the Sleeping Giant lounges on the distant Canadian shore. Buoys mark the entrance to McCargoe Cove, a narrow bay that makes a diagonal slash into the interior of the island. 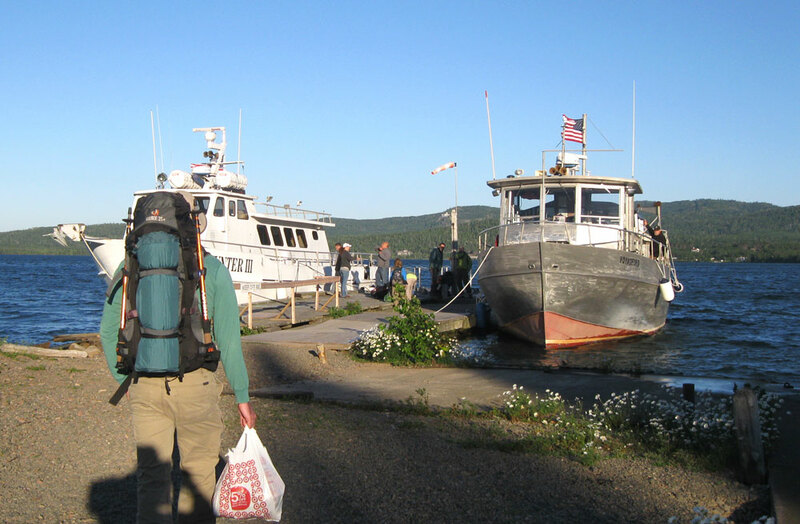 We disembarked at the dock along with a few others and got prepared to set off into the woods. 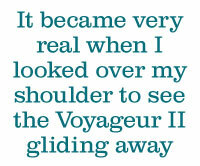 It became very real when I looked over my shoulder to see the Voyageur II gliding away. We’re really on our own now. McCargoe Cove to the left. It was only a 2.5 mile hike to get to our first overnight stop, West Chickenbone Lake campground. We didn’t meet any other hikers on the way, just incredibly dense forest and total silence. Indian Portage Trail is easy to follow, but with only a few people passing by every day, there are lots of encroaching plants to plow through. After a little more than a mile, the trail begins to follow the shore of Chickenbone Lake. Our destination campground is located at the southernmost point of the V-shaped lake, just beyond a long stretch of narrow boardwalk trail. Upon arrival we found a few groups of campers already getting situated. We checked out the real estate and found campsite 2 to be a lovely, shaded plot. Having practiced our tent assembly a few times, we had the place looking habitable in no time. After meeting some neighbors, we took a quick walk along Indian Portage Trail over the Greenstone Ridge and down to the edges of Lake Livermore and Lake LeSage. This is where the true peacefulness of Isle Royale set in. We found ourselves a half hour walk from our campsite on the largest island in the largest freshwater lake in the world. There’s no phone service, no radio, no cars, no machines, just water like glass and an occasional bird call. This is awesome. Back at camp, it was time to take care of the more practical things, mainly dinner. Our cookware consisted of camping gas and a small burner attachment, a couple pots and some space-efficient utensils. We took the advice of previous visitors and packed in dehydrated meals from the Mountain House brand. They’re compact and lightweight and require only a couple cups of boiling water to “cook” in the bag. The beef stew was actually tasty, with chunks of meat, potatoes and vegetables that plumped up nicely. We almost forgot they had been unidentifiable shriveled nuggets just ten minutes earlier. We even brought a small pack of Oreos for dessert, because we have priorities. It paled in comparison to the home-cooked meals we’d become accustomed to at the Arrowhead Lodge at Voyageurs, but it got the job done. To fully understand the remoteness, the topic of water is a good place to start. There is a water source in each campground, but keep in mind that by “source” I don’t mean a faucet, I mean a place to dip water out of a lake. It then must either be filtered or boiled for three minutes to be clear of parasites. (Windigo and Rock Harbor have the only campgrounds with running water.) Drinking water was probably the issue we put the most thought into. We initially thought we’d be able to pack in enough for three days and thereby avoid filtering/boiling, but quickly realized that it was unrealistic from a weight and space standpoint. We ended up packing two liters in our backpack reservoirs and four additional liters to use as drinking water for the first two days. We bought a simple filter from Sawyer so we could replenish our supply after that was used up. A filter rated at 0.4 microns or less is recommended, so we bought a 0.1 because we’re not messing around. The water in the interior lakes isn’t exactly appealing. It has a light brownish tone and a slight earthy flavor even after filtering so we used it only for cooking the first night. It might have been overkill, but we still boiled it because we were determined to not bring home any pet tapeworms. The water source area also became the unofficial West Chickenbone social gathering space. After cleaning up dinner, we took our flasks to the water’s edge and met the nice ladies from campsite 3, a trio from Michigan and Wisconsin on an annual getaway. Soon they invited us into their card games and taught us two neither of us had played before. When the light started to fade, we knew it was time for one more deal and then we had to head to our tents. The sun stays up late that far north, but the light fades quickly once it drops, so we arranged the tent for sleeping by lantern light. Rangers highly recommend putting everything either inside the tent or secured to something outside because of thieving animals. Isle Royale foxes and squirrels have been known to run off with hikers’ shoes, and that wouldn’t be any fun. There’s nothing quite as satisfying as sleeping in nature, going to bed when the sun goes down and rising when it returns. Chickenbone Lake would be our most remote campsite by far. The only thing that woke us in the night was a strange animal howling sound. 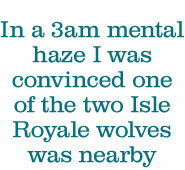 In a 3am mental haze I was convinced one of the two Isle Royale wolves was nearby, but we later found out it was just the call of a lonely loon looking for friends. At sunrise we emerged from the tent and cranked up the burner to make coffee and boil water for our dehydrated breakfast. The Mountain House scrambled eggs and bacon are surprisingly realistic. After packing up, we hiked in the direction of the Greenstone Ridge Trail. 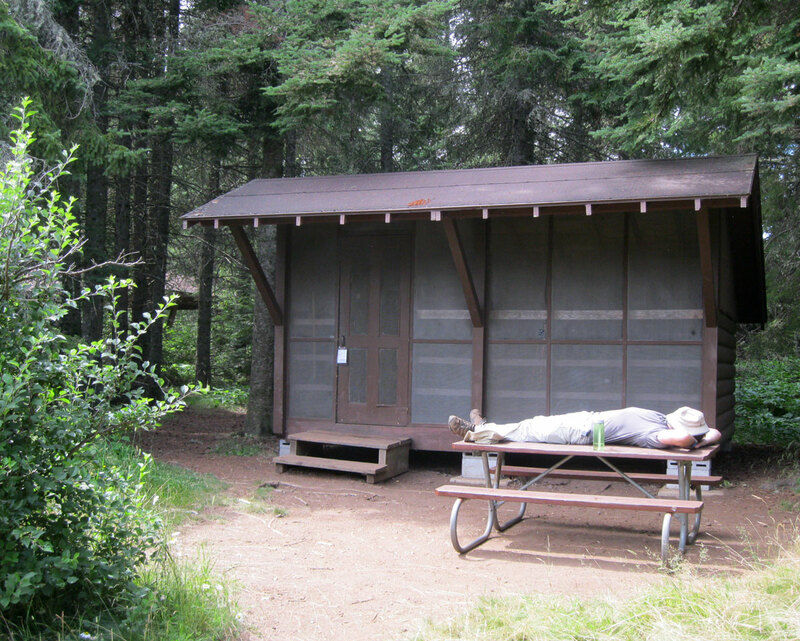 Our target destination for the day was Daisy Farm campground, eight miles away on the Lake Superior shore. Greenstone Ridge is the backbone of Isle Royale, a high spine of rock running its entire length. The name comes from Chlorastrolite, a greenish semiprecious stone found on Isle Royale that is the state gem of Michigan. A 40-mile trail traces this ridge all the way across the island from Windigo to Lookout Louise. Lots of hikers do the entire length over the course of about a week, but we only spent six miles on it. About two miles out of Chickenbone, Greenstone Ridge Trail doubles back and ascends a steep incline to the best views we’d seen yet. The exposed rocky ridge gave us a clear view across Lake Superior to Canada and a sea of uninterrupted trees and ridges below us. Greenstone Ridge Trail: Thick brush, view from the top with Canada in the background, rocky trail. Our visit corresponded with unusually warm temperatures on the island. Normally summer highs only reach the mid 70s, but the sky was cloudless and the sun heated the interior of the island to the mid 80s. The inclines here are gentler than hikes we’ve done in the West or Alaska, but the heat combined with the 40 pounds on our backs made for tiring going. We got into the rhythm of stopping every two miles to take a summer sausage and tortilla break and drank water constantly. Six hours in, at the point where Daisy Farm Trail splits off, we had a choice between descending to the campground the short way or continuing on Greenstone Ridge to the Mount Ojibway fire tower and then taking the Mount Ojibway Trail to Daisy Farm. We might now regret this decision, but we took the easy way and missed the great view from the fire tower, but at that moment a 1.5 mile downhill walk sounded better than climbing another 400 feet in elevation to Mt. Ojibway and extending our daily mileage from 8 to 10. As it was, we teetered into Daisy Farm campground exhausted, but we got there early enough to score a camping shelter with a picnic table and everything. The lap of luxury by Isle Royale standards. Resting at the Daisy Farm shelter. Daisy Farm is remote, but felt bustling in comparison to West Chickenbone. The ability to arrive there by boat from Rock Harbor means people staying there haven’t necessarily hiked in. After setting up in shelter 3, we joined other people gathering water from the lake. By this point, we had finished our fresh water supply and needed to filter water for drinking as well as cooking. Lake Superior water is vastly superior to that of the interior lakes, it’s chilled and crystal clear. It takes a while to squeeze 8 liters through the filter, but there’s no sense of urgency on the island and the wait provided us an opportunity to rinse out some clothes as well as ourselves. A friendly duck even joined us for a bathe. With our water supply replenished, we prepared the evening’s dinner of macaroni and cheese fancified with summer sausage chunks. Afterwards, we grabbed a spot on the Daisy Farm dock to watch the sunset while sipping bourbon. The calm evening water looked like a mirror reflecting the entire scene; an Isle Royale sunset is definitely not to be missed. Before it got too dark, we retired to the shelter. We had still set up the tent inside the 3-sided structure (the fourth side is screened) to keep any crawling things away from us in the night, but at least we didn’t have to put on the rain fly and there was plenty of space to spread out supplies without fear of ill-intentioned squirrels. Views along the Rock Harbor Trail. 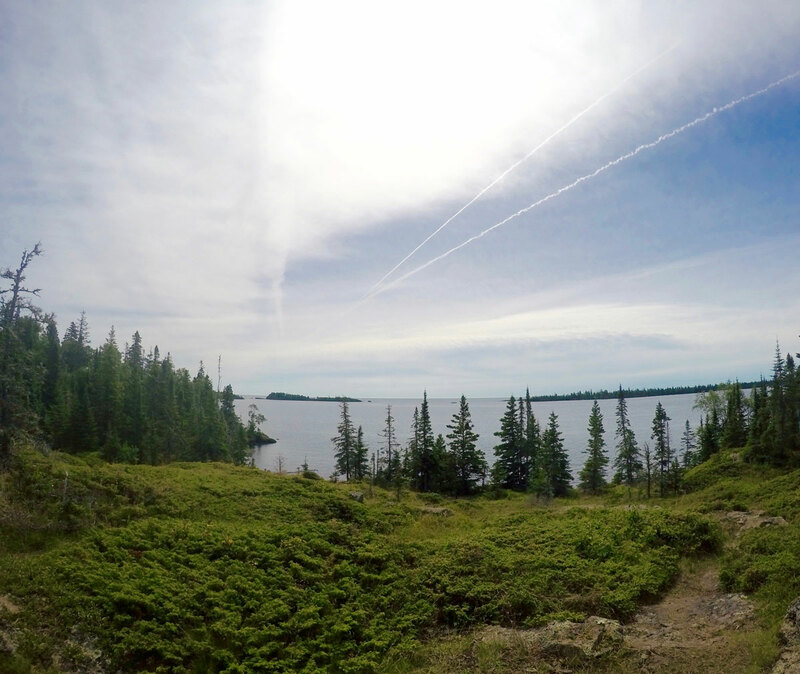 For our third day of hiking, we just had to trek seven miles to our final Isle Royale destination, Rock Harbor. The Rock Harbor Trail follows the shore of Rock Harbor the entire way, with views of the lake and outer barrier islands, including park headquarters on Mott Island and the Rock Harbor Lighthouse. This trail is much flatter than the Greenstone Ridge, but there are some rocky areas that require careful footing, so while easier, the going wasn’t much faster overall. After a couple hours, we stopped for a rest on the dock at Three Mile campground. At this point, we were within day-hiking distance of Rock Harbor, which meant we ran into a few people who had just left the lodge for a morning hike. One lady cheerily asked us “Why are you so sweaty! ?” We just pointed to our backpacks and said “this”. The final push was a three mile section alternating between thick forests and rocky clearings with beautiful views of the harbor. A quick side trail up a hill leads to Suzy’s Cave, a sea cave that formed when the level of Lake Superior was much higher. Sensing the end of our journey, we practically sprinted the final mile, arriving at the Rock Harbor campground about four hours after departing Daisy Farm, giving us the whole afternoon to hang out in the most developed part of the island. We again found some vacant shelters and claimed number 8, then walked over to check out the area around Snug Harbor containing the visitor center, convenience store, docks, lodge and restaurants. 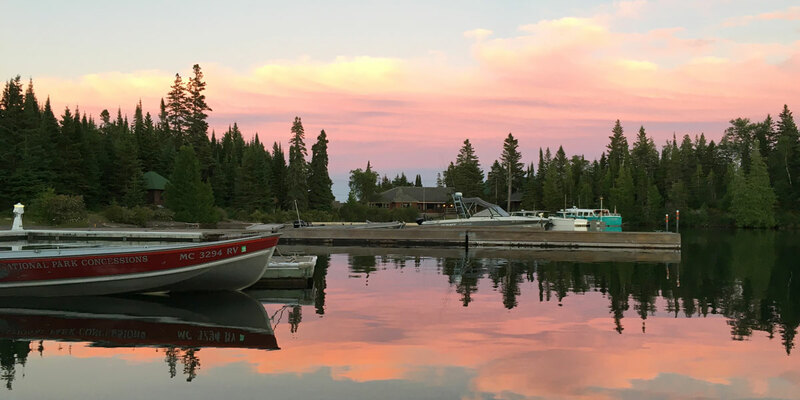 Rock Harbor is where the majority of visitors arrive and spend time on Isle Royale. It’s the docking point for the two boats from Michigan (Isle Royale Queen IV from Copper Harbor and Ranger III from Houghton) and the overnight layover for our Voyageur II from Minnesota. We poked around the visitor center and convenience store and then made a beeline for the Greenhouse Grill’s outdoor patio where we knew there was beer waiting for us. The selections from Keweenaw Brewing hit the spot, but what we were most looking forward to was the showers. Tokens purchased from the convenience store provide five minutes of glorious hot water in the shower stalls on the back side of the restroom building. Feeling all fresh, we spent some time strolling the area before dinner, visiting Tobin Harbor on the other side of the narrow peninsula and hoping to see a moose (we never did). We went to the Lighthouse Restaurant for dinner, the slightly fancier side of the lodge dining hall. It’s the same basic ambiance, but has a wider variety of entree dishes, while the Greenhouse Grill’s menu leans more toward sandwiches and pizza. After stuffing ourselves with chicken, pork, ice cream sandwiches and wine, we went to the evening program with Ranger Lori She shared her experiences living and working on the island and taught us the language of loon calls. Yet again it was time for an amazing waterfront sunset, so we watched the show from a dock in Snug Harbor. The night was restful as usual but we stepped out of the shelter around 3:00 to see the Milky Way. In the morning we enjoyed a non-dehydrated breakfast at the Greenhouse Grill and waited for the Voyageur II to be prepped for the 9:00am departure. Cruising along the southern shore after having hiked across the island, we had a totally different perspective than when we arrived four days earlier. 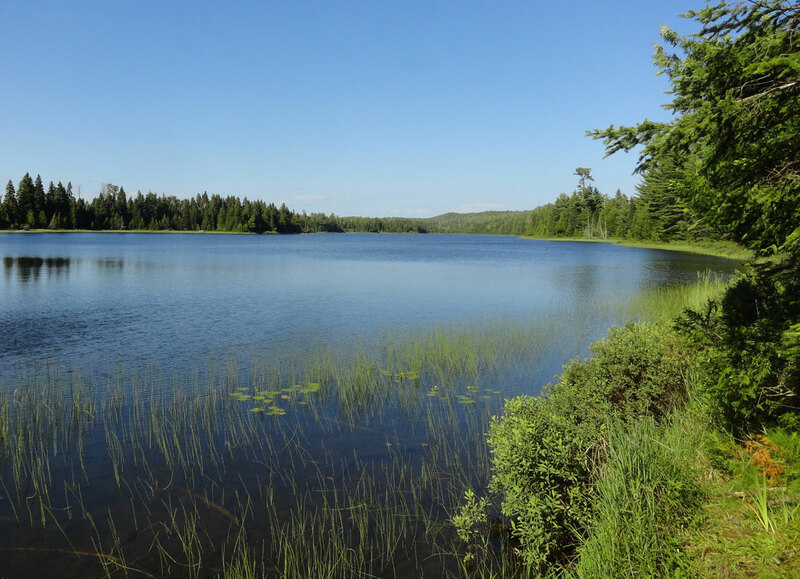 It was seven hours by boat from Rock Harbor back to Grand Portage, Minnesota, with brief stops at park headquarters, Chippewa Harbor and Windigo. Ranger Kaitlyn was there on the same Windigo dock where she’d given us our welcome intro, but now she was doing her best pageant wave as we floated away. An hour from shore, my phone picked up a cellular signal from Canada and our seclusion was officially over. We hadn’t missed the outside world one bit while we were away, proof of just how engaging Isle Royale is. This entry was posted in Destinations, Travelogues and tagged Chickenbone Lake, Daisy Farm, Greenstone Ridge, Isle Royale Camping, Isle Royale National Park, McCargoe Cove, Mining, Ojibwe, Rock Harbor, Voyageur III. Bookmark the permalink.